I did get two awards though. For as long as I have been lurking around in blogland I've seen awards and wondered what the big deal was. Well, now that I am part of this new world of blogging and have met so many wonderful people, I have a greater appreciation for all of the creativeness, the humor, the reality of being a mom that is shared for all of us to read, enjoy, sympathize with, and be encouraged by. So, thank you Zoe (from A Day in the Life) and Adrienne (from Some of a Kind) for the awards you have given me. Now the fun part...giving the awards to others! The first award I received was from Zoe. She is so sweet. It's a shame she lives so far away because I know we would be great friends. Our children are close in age and have the same love for Star Wars. Zoe is also pretty darn crafty, too. I don't know how she squeezes in her sewing time, but she does and the outcome is always fabulous! Go ahead, visit her blog, be inspired! 1) You have to pick 5 blogs that you consider to deserve this award, creativity, design, interesting material, and also contributes to the blogger community, no matter of language. 4) Award-winning blog and the one who has given the prize have to show the link of "Arte y pico"blog , so everyone will know the origin of this award. 1. Adrienne at Some of a Kind shares her love of her family as well as her love of sewing. She's got some real talent and encourages us to join in. Sometimes all we need is a "come on, join me in a sew along" just remember to bring your seam ripper. We all need it eventually! 2. Kristen at Grace Violet has a wonderful blog full of creativity and inspiration. And even when a project doesn't go quite right, you know the kind you put away until you can deal with it, she shares her mistakes and her 2nd tries so we can give it a try, too. 3. The mom & daughter duo over at A Spoon Full of Sugar are two crafty girls. They are always cooking and creating and sharing it all with us...all the way from Australia. 4.Ellen at Hurrayic is always sharing great food, great sewing projects, and great family stories. Oh, and she has fabulous giveaways...remember this? Yeah, that was from Hurrayic! I'm so glad she decided to de-clutter....now all I need to do is create something fabulous for the girls' dress-up box. 5. Kristen at We are THAT Family is so funny! Seriously. She has a way with words that makes being a mom, even on the worst of days, a hilarious blessing. Real life at it's finest. And just when you think that no one else could possibly understand the journey that is motherhood, oh, just go check it out...you'll love it! Wow, choosing is not that easy... there are so many great blogs out there. The second award I received was from Adrienne. What fun it is to visit her blog, see her new creations (hanging on her tree), and read the stories of her life as a mom, crafter, and seam ripper. 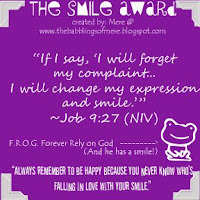 Thank you so much for the Smile Award. I am so thankful that you enjoy visiting my blog, even if it rains on laundry day! These are the rules: 1. The recipient must link back to the award’s creator. 2. You must post these rules if you receive the award. 3. You must chose 5 people to receive the award after receiving it yourself 4. You must fit the characteristics of the recipient of the award, as posted by Mere. 5. You must post the characteristics of a recipient. 6. You must create a post sharing your win with others 7. You must thank your giver. So now comes the hard part...choosing the recipients. 1. Zoe from A Day in the Life certainly fits the characteristics for this award. Loving her kids, her husband, her sewing, her crafting! I do hope she enjoys receiving this Smile Award. 2. My dear friend Theresa from The Daly Tribune. She is an inspiration, an encouraging friend, she adores her little ones and her hubby. I know she will love the verse from the award and smile. 3. Amy from The King's Table loves her two beautiful children and her husband. I love to read about her journey through motherhood. She is so sweet and funny. A Smile Award, she certainly deserves! 4. Rebekah of Sunnybrook Farm Designs has a wonderful talent and two beautiful daughters ( one who just got glasses and is so so cute). It is obvious that Rebekah loves her family. She often shares her talent and some joys of motherhood. 5. Jade from Chikaustin is one who loves her kids, is a talented crafter, and interior decorator extraordinaire. She pretty darn funny too. Wow! I do hope that you all enjoy your awards. Keep those creative juices flowing so we can all be inspired! Thanks so much ANG!Thanks for all the great links in this post :) Love the scavenger walk you did recently with your children - I used to love doing that when my kids were small. Wow! What a sweet thing to say. I was very interested in reading my take on motherhood, because it's been one of those days and I need a laugh! Ha! Seriously-thanks! You are the best! Wow! You are so sweet; you made my day!